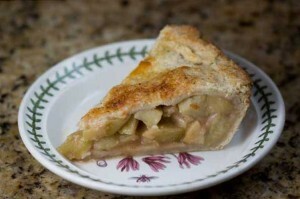 An apple pie made with apples that have been broiled before being put in the pie. On a floured surface, roll out half your dough to make a 12 inch circle. Place in the bottom of a deep dish 9” pie plate. Chill dough-lined pie plate while you prepare the apples. Preheat the broiler. In a large roasting pan, toss apples, cinnamon and 2 tablespoons of the sugar. Position the pan so that the apples are about 6 inches under the broiling element. Watching carefully, broil until the tops of the apples begin to brown (you do not want them cooked through, but rather just caramelized around the edges a bit). Remove from heat. To the roasting pan of apples, add the remaining sugar, flour, and salt. Stir until evenly mixed. Stir in apple juice, vanilla and cream. Pour apple mixture into the crust. Roll the second section of pie dough out to a large circle on a lightly floured surface. Place on top of the apples and pinch the top and bottom dough edges together to enclose the apples. Slice 1” air vents around the top of the pie. Make the egg wash: Mix the egg in a small dish and mix in cream. Lightly brush the egg wash over the top of the pie and along the edges. Sprinkle with coarse sugar. Place the pie on the center rack of a preheated 400 degree oven, and set a rimmed cookie sheet on the lower rack to catch any drips. Bake at 400 for 30 minutes. If after 30 minutes the crust appears to be browning rapidly (this will depend on which crust recipe you use), cover loosely with aluminum foil. Turn pie. Continue to cook for another 15 minutes. Continue to cook for 7 minutes, as needed, until the crust is golden brown and flaky. This pie is delicious, but may be a bit runny if you serve it the day you make it. If you want it to hold together better, bake one day ahead, chill overnight and return to room temperature.